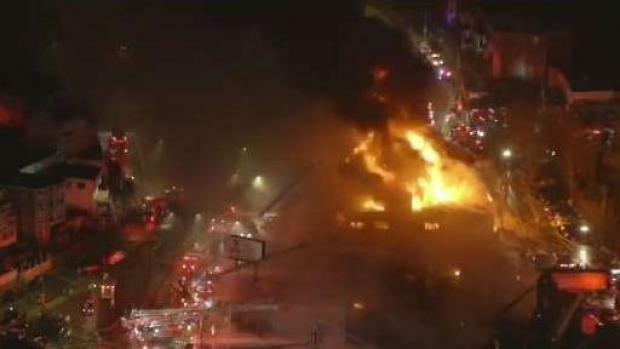 Blue Line commuters disrupted after casket company fire. Officals aren't sure when subway line will reopen. Toxic fumes and smoke filled the entire East Boston neighborhood on Friday, but the scene was much different over the weekend as the cleanup after the nine-alarm fire got underway. "It's heartbreaking," owner of the New England Casket Company Louis Tobia, Sr. said. "But you know you can't bury your head in the sand." On Sunday morning, the effects of the fire reached beyond the damage to the building. It's unclear whether the Blue Line subway connection will reopen soon and buses continue to shuttle riders outbound past the airport stop all the way to Wonderland station. At the scene of the blaze, demolition is underway and Tobia is facing the devastation head on, but the fire destroyed 75 years of work. His family's business was started by his father many years ago. 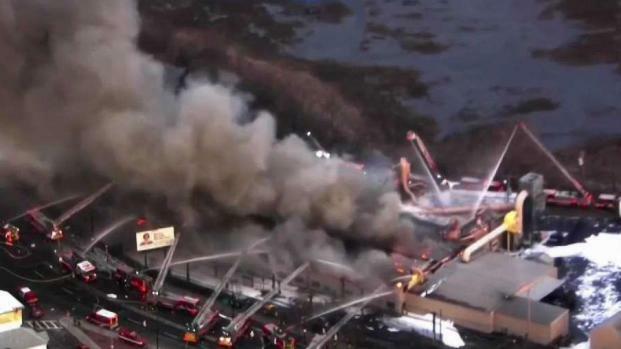 Demolition is underway in East Boston after a massive 9-alarm fire destroyed the New England Casket Company. "He came over from Italy when he was 19-years-old. He had 18 bucks in his pocket, and the cab driver took all 18 bucks," Tobia Sr. said. "I see the smoke. I can't breathe. I leave," Joe Pacheco, an employee of the company, said. Louis Tobia, Jr. says they have a rooftop furnace that heats one of their drying ovens, and it was the furnace that started the fire. Tobia, Jr. says he isn't sure what's next for the company. "We didn't think it would end like this, you know? And who knows. We're not making any decisions. Maybe we can rebuild," he said. For now, nearly 100 employees are out of work, including Pacheco, who has worked here since he immigrated from Portugal over 25 years ago. "I need to find a new job," he said. Even his car burned in the fire. "We will be concerned about, you know, what materials are inside the building, and that's why we're going to take it apart as opposed to just demolish it," Boston Commissioner of Inspection Services William Christopher said. Although the disaster devastated his business, Tobia, Sr. still sees the silver lining. 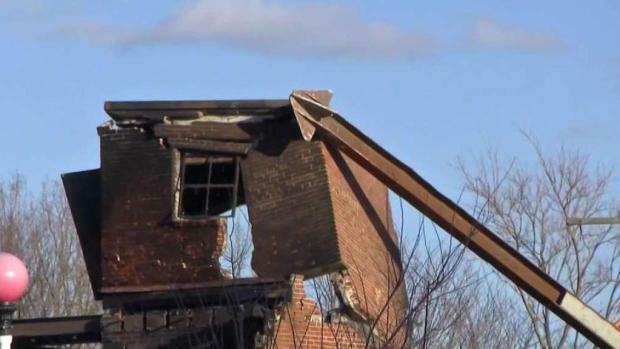 The Tobia family, which has owned the New England Casket Company for 75 years, is reeling after the company's entire building was destroyed in Friday night's fire. "This is a material thing. When you lose somebody like your wife or your kids, that's important," he said. It's still unclear whether the company will rebuild, but the owners say they just want to make sure their employees are taken care of. About 100 Boston and Chelsea firefighters fought the flames, which filled the air with noxious fumes from hazardous chemicals in the building, until they were knocked down around 10:30 p.m. Friday. Firefighters say they had a difficult time getting water to the fire. Both Mayor Marty Walsh and Governor Charlie Baker have said they plan to look into the issue. Initially, firefighters were ordered out of the burning building due to unstable conditions that ultimately caused three buildings to collapse. The entire area surrounding the buildings was also evacuated Friday afternoon. By Friday night, Boston Fire Commissioner Joseph Finn announced that residents of Orient Heights could return home. "Things in very dangerous shape right now. We're in pretty good shape. The neighborhood, we are allowing residents to go back into the buildings, into their homes. We have been monitoring their quality since early evening, and its acceptable level, so we're allowing people to go back into their homes." 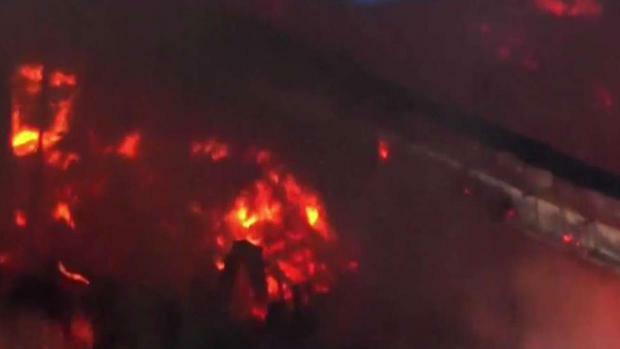 Mayor Walsh said Friday it was the biggest fire he's seen during his tenure as mayor. He also said the fire commissioner always had concerns about the building. "...because the way it was built," Mayor Walsh said. "It wasn't one consistent building. It was a building, added on, added on. A lot of wood, a lot of saw dust. A lot of chemicals." The New England Casket Company is a family-run company that's been in business for over 75 years. According to the Boston Globe, the company made a mahogany casket, called the Concord, for Muhammad Ali, Anna Nicole Smith, Heath Ledger, Walter Cronkite, Joan Rivers and Tip O'Neill. Two Boston police officers were hospitalized for smoke inhalation, two Boston firefighters were hospitalized for exhaustion and one Chelsea firefighter suffered a leg injury. As of Saturday morning, the Blue Line of the T remained affected by the fire. 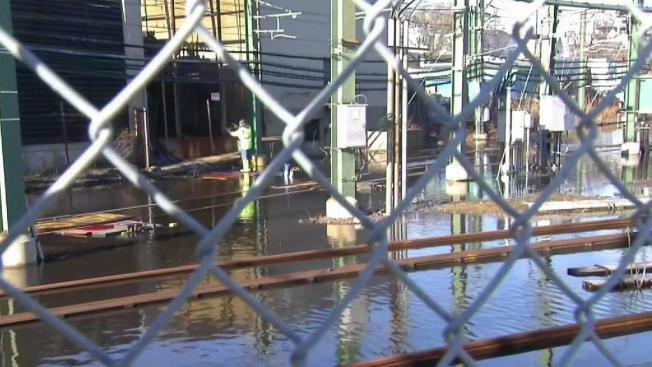 According to the Massachusetts Bay Transportation Authority, personnel and equipment were assisting in draining water from the Orient Heights station and the train yard, which was completely flooded. Workers replaced fencing Saturday that had to be removed during the firefighting efforts. Shuttle buses will continue to replace service between Airport and Wonderland Station until further notice, the MBTA said. "We are working to resume service as quickly and safely as possible and will keep you updated on what's happening. Thank you for your continued patience," the MBTA said Saturday morning. 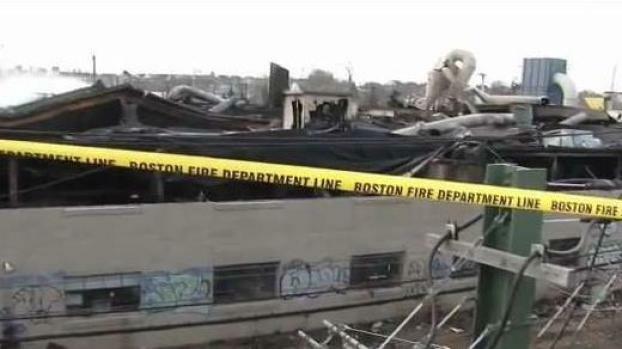 A nine-alarm fire at the New England Casket Company in East Boston forced residents in the area to evacuate and caused three buildings to collapse on Friday. Several police and firefighters were hospitalized for injuries.